Hard drive failure is a definite reality that every computer user will face every day. This is a fact. It happens either due to physical or logical hard drive errors and can result in major data loss which in turn can cost money when you try to recover the lost data (When data on the hard drive become inaccessible or corrupted is referred as data loss). Therefore, it is the life’s little surprises, you must be prepared for. Whenever, your system fails suddenly and your computer keeps restarting or you hear a clicking noise from your hard drive, you must be aware that your hard drive can become corrupt or crash at anytime. In this article, you will find causes of hard drive failure and the necessary steps to overcome this problem. Physical Failure: Physical failure is the major cause of hard drive failure results in damaged inner equipment’s such as platter, head crash, spindle motor etc. But there is a good possibility that your data is still intact and accessible by some special recovery software. Most common reasons behind physical hard drive failure are due to bumping, jarring or dropping the computer while it is running. Mechanical Failure: When the hard drive equipment’s itself become crashed or faulty, such as a head crash, spindle motor or bearing, excessive heat etc., your hard drive will become no longer accessible. You should immediately stop using the disk and send it to a reputable firm providing data recovery services to preserve the chances of data recovery. Most common symptoms of mechanical hard drive failure which you might recognize yourself are: an internal clicking noise or maybe a windows error message while booting. for example the message might say ‘no hard drive found’, ‘operating system not found’ or something similar. Logical Failure: In most of the cases, your hard drive may fail due to logical errors, which can be very difficult to deal with. Errors such as file system corruption, invalid entries in registries, virus/malware attack etc. These are the most common factors responsible for making hard drive logically damaged and you almost need to be a techy person to handle this kind of situation, because any wrong attempts will make hard disk data permanently non recoverable. If you do enough damage this can mean that recovering your files will not be possible any longer. Scheduling a regular backup will helps in majority to keep your data available in any unavoidable situations. So, if you have any backup copy already created then it will surely become a life savior for your data. Using registry editor software to fix invalid entries automatically. Check power cables, unplug the drive and reconnect it to pc board etc. and see if it helps in starting your hard drive to work again. Various kind of data recovery software are available online which can be used to recover data in any kind of hard drive failure. These software uses powerful algorithm to deeply scan every bytes of data which can be recovered. External Hard Drive Not Working? Fix It Now. Oliver is a data recovery specialist and part time blogger contribute many articles on top blogging sites related to Hard Drive Data Recovery Software, Hardware failure, data loss etc. You can follow Oliver on Google +. You can get the knoppix live CD to recover data from Ubuntu. Though, You can recover data using master-slave methods, but the best thing to do is to find an efficient recovery software. One thing that can help overcome some of the problems of mechanical hardrive errors is to get a digital disk. I have one and the computer was able to survive a pretty heavy drop. The damage was enough to take a large chunk out of the computer by the SSD drive held up and the computer continues to work today. Data loss is VERY serious. I do frequent backups on two different disks. When you lose data once, you will never want that to happen again. Hard disk crashes results in permanent non recoverable data loss situations. 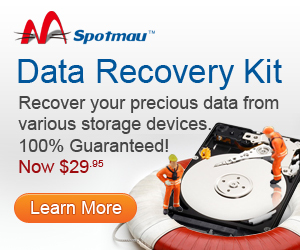 Tough, you can try some professional recovery software, specialized in recovering data in most critical cases. After a few bad experiences I decided to use an external hard-disk to back up the important data on my computer. Since then I haven’t had any issue of this kind. Good work Jack!! But do prepared for future because disasters can strike your system any time. Very true marty….It’s better to prepare your self before any disaster happens. Taking backup and distributing it would be preferable.